Originally inspired by 2001’s Bugaboo Frog, the Bugaboo Fox Classic offers you a timeless palette of muted shades, sophisticated patterns and soft fabrics. Microfleece lining - Instantly recognisable, yet understated thanks to its quilted microfleece lining in fresh white. Coordinating Bassinet - Make your Bugaboo Fox Classic is suitable from birth with the matching bassinet (included). Black Wheels - Black wheel caps for a classic finish. Leather-Look Handlebars - Luxurious leather-look handlebar in black. At home or on the go, the Bugaboo Fox is designed to fit your lifestyle. Going about your day, shopping, travelling and exploring the outdoors have been made easier thanks to the smoothest ride, the lightest push and the best driving performance yet. 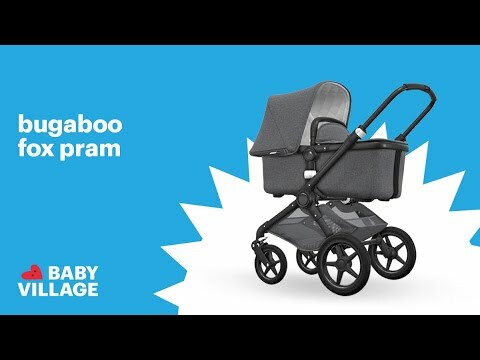 Effortless push and agile steering make this Bugaboo pram the best in its class. Take it anywhere, from city streets to outdoor trails - the advanced all-wheel suspension and big wheels ensure a smooth, stable ride no matter the surface. The chassis is robust and strong, suitable for children up to 22kg. Yet it’s still the most lightweight comfort pram on the market (less than 10 kg) making it easier than ever to lift, carry and transport. Integrated Attachment Points - Simply click Bugaboo Accessories directly onto the pram's integrated attachment points. Easily install accessories like the cup holder or wheeled board, then head out to explore. High Seat Placement - The pram's seat is positioned at an optimal height, without compromising the stability of the pram. Perfect for lifting your child in and out.